Ballet is totally fascinating to me. I wanted so badly to be a ballerina when I was little, but that never ended up happening so anytime there is a ballet book or a ballet movie/show, I’m all in! This one really caught my eye because it’s been described as Black Swan meets Pretty Little Liars, and I LOVE Pretty Little Liars. So many high hopes for this!! But my hopes came crashing down about a quarter of the way through when I realized that, yes, it had that air of mystery and drama that I love, but no, it wasn’t good. 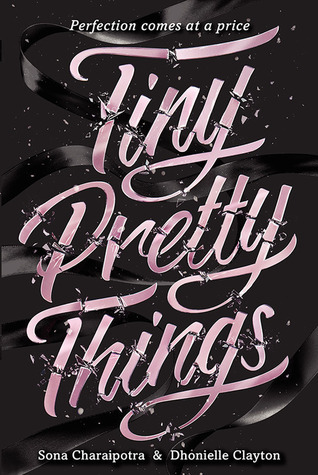 My main issue with Tiny Pretty Things is that there were way too many voices, and to me, it didn’t feel like there was any pattern or order in which we read them. I’ve read books with 3 narrators before, but this felt so overwhelming! So many details and specifics that happened to each girl, and with the opening of the story being someone totally different? It really threw me off and in the end, I didn’t really relate to any of them because I couldn’t get to know them well enough. It was really disappointing. It felt like the authors really wanted me, as a reader, to get to know so many people (all the girls, Henri, Alec, etc.) but it didn’t work that way at all. Finishing the book, I feel like I didn’t really know any of them and like it was a huge waste of time. It would have been SO much better coming from one perspective instead of 3. Honestly, I can’t really think of anyone I’d recommend this to. It wasn’t the worst book I’ve ever read, but I do wish I could get those hours back & spend them on a book I’d love. I ended up giving it 2/5 stars on Goodreads, which I hate doing! Hopefully the next book I read is better. I started this once and only go a few chapters in before giving up. I’m glad to hear I didn’t miss anything.